The most important determinant of government debt sustainability in the long run is the difference between the real interest rate the government pays on its debt (“r”), and the real growth rate of the economy (“g”). An “r-g” of greater than zero causes the debt stock to increase over time. An “r-g” of less than zero causes it to fall. So what has happened to “r-g” since the financial crisis? As growth in advanced economies has fallen, so have interest costs, which has supported sustainability: on average, “r-g” has increased only slightly from -1% to 0% (Chart). Behind this, real growth has fallen more than twice as much as real interest costs (from 3.7 to 2.1%, vs 2.7 to 2.1%). This has been driven mostly by smaller advanced economies. In the larger, G7 countries “r” has fallen more than “g”. 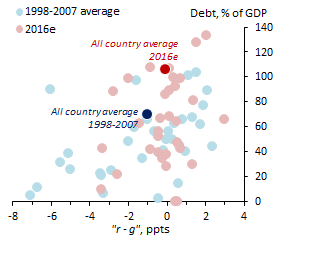 One risk ahead is that growth continues to disappoint and for some countries “r” approaches a lower bound with less room to support debt sustainability. Governments could insure against this risk by issuing GDP-linked bonds, where payments adjust downwards when growth disappoints. This could have wider benefits for the system as a whole by avoiding costly and disruptive debt restructurings. Source: IMF and author calculations. Notes: “r – g” is the effective interest rate on outstanding government debt deflated by inflation, minus real GDP growth. Estimates for 2016 are based on IMF “nowcasts” made in Oct 2016. Mark Joy works in the Bank’s Global Spillovers and Interconnections Division. Don’t you think that your analysis should take into account the difference between those governments that issue their own currency and borrow in that currency and those governments that do not? The Eurozone nations do not issue their own currency. They are analogous to US states in this regard. The US, the UK, Japan, and other nations issue and borrow in their own currencies. The meaning of the relation between national debt and GDP is different in the two cases. What would your graph look like if you were to distinguish these two types of states? Given all the recent talk about negative interest rates, doesn’t the above analysis actually encourage/support the idea in order to bring government debt as a share of GDP to lower levels?